Martin Perry 30th January 2016 30th January 2016 Comments Off on Tennis Psychology: Angelique Kerber – The Steffi Graff Effect! So Angelique Kerber secures her first Grand Slam title. Holding her nerve to win the third set. when she might have been expected to buckle under Serena’s big-game pressure. It turns out that Kerber received a textual message from her idol Steffi Graff on the morning of the match. Can a textual message win a player a Grand Slam? Not by itself. But it can carry influence. We don’t know what the German legend texted, but it was probably a droplet of champions wisdom accrued from securing twenty-two Grand Slams. Because of Angelique’s idolatry for Steffi, it’s equal to receiving a message from God. Pure truth. A precious gem to be held in reverence. Kerber still has to go out and overcome the supreme force that is Serena Williams. But doing so with a little bit of stardust in her back pocket. As if a textual message from Steffi Graff brings her into your world. 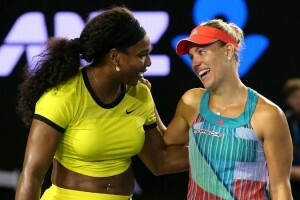 Thus Kerber + Graff’s wisdom v Williams. In her winners speech, Angelique Kerber showed how much emotion she had been keeping at bay on court. Emotions which could have easily undermined her focus and sense of certainty. Emotions which could have caused her to buckle under pressure. But that wouldn’t have been the Steffi Graff Way. For when you feel that you have the great German champion in your corner, your fears simply can’t hold sway!